Android docks are thin on the ground, mostly because there's just too many phones and tablets for accessory makers to invest in developing them. 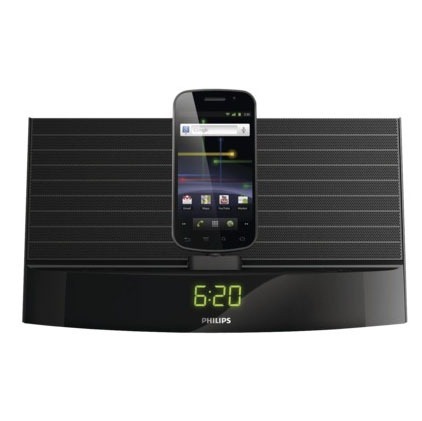 Philips is the exception, and while their range of Fidelio docks have been well-received, they're also pretty expensive. 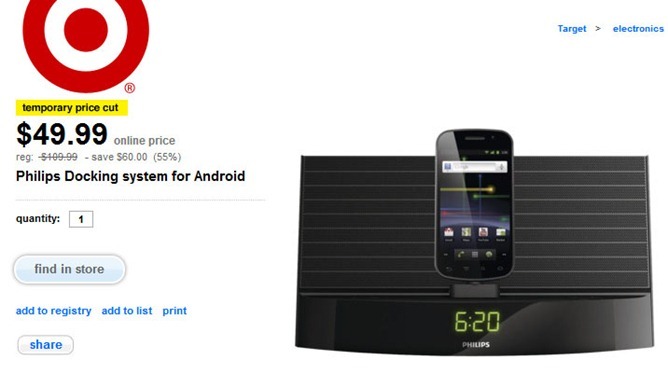 On that note, you can pick up the Fidelio AS140/37, their mid-range Android speaker dock, for just $49.99 in Target stores. 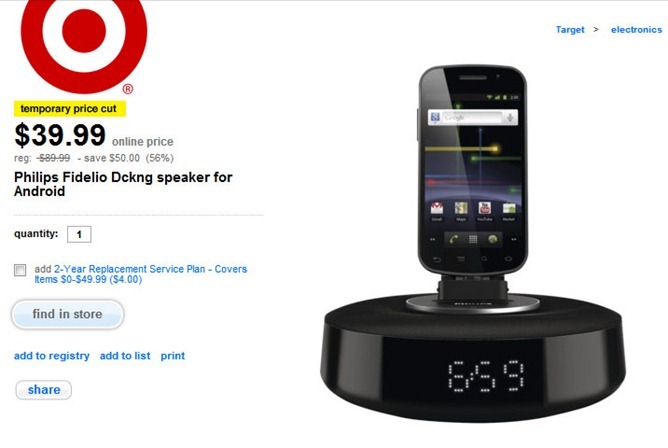 That's $60 off the suggested retail price, and more than $30 off of Amazon's price. The deal is not available on Target's website - trying to get it into your cart will only return an error. We called a local store to make sure the deal is active. The Fidelio docks are "universal" for basically all Android phones (and at least some Android tablets). This is accomplished with a MicroUSB connection that twists 180 degrees and moves a few inches laterally, making it possible to dock and charge nearly every phone out there - though those with a top-mounted USB port may be a little tricky. Check out our review of the bigger AS851 for a look at the mechanism. Music or other audio is streamed over Bluetooth, or via a standard 1/8" jack if you want more fidelity. You can also get the smaller and less powerful AS111/37 model for $39.99. Philips also has a free app for more precise dock control, but it's just short of useless - After testing the AS851, we can testify that you're better off just using your device's standard controls. Unfortunately, the Fidelio AS140 won't work with Galaxy Tabs, Transformers or other tablets with non-standard charging ports. On the bright side, it will work with anything that handles A2DP Bluetooth streaming, so an older Android phone can combine with Google Play Music, Pandora or the like to become an instant wireless jukebox.